Perhaps you’ve been thinking about a trip to Iceland, but can’t decide how to get there. 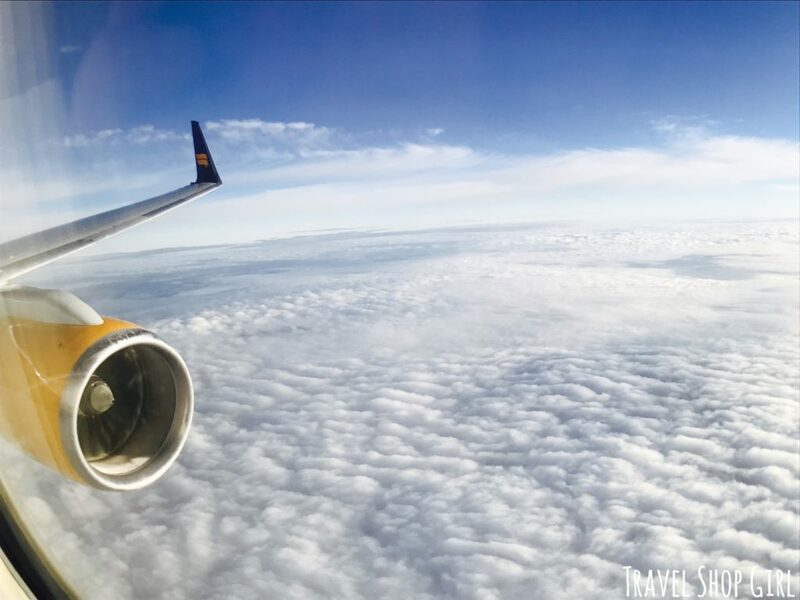 With different airlines and classes of service to Iceland, here’s my short list of 10 things you should know about IcelandAir Economy Comfort. While this is my experience flying out of Boston, you may encounter the same service when you fly, so read on. This wasn’t my first time flying Economy Comfort with IcelandAir. I learned my lesson on a prior flight with IcelandAir not to get in the same line with Economy passengers at Boston Logan airport. Look for the overhead sign that says Saga Class and go there to check in. I promise you, it will make your life easier and you won’t have to stand in line. There were only two ticket agents handling the long lines and I was glad that I wasn’t in the much longer Economy line. Both Saga Class and Economy Comfort class passengers are invited to visit the Air France lounge at Boston Logan International Airport. It’s a basic lounge with nothing fancy, but there’s plenty of seating, beverages, and both hot and cold food. 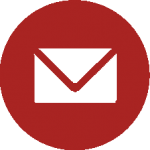 The front desk people are always ambivalent at best when you check in, but just ignore them. Grab a seat, charge your phone or other electronics, and enjoy some snacks before your flight. As for me, I grabbed a Pellegrino, some prosecco, and wasabi peas and dates. Strange, I know. 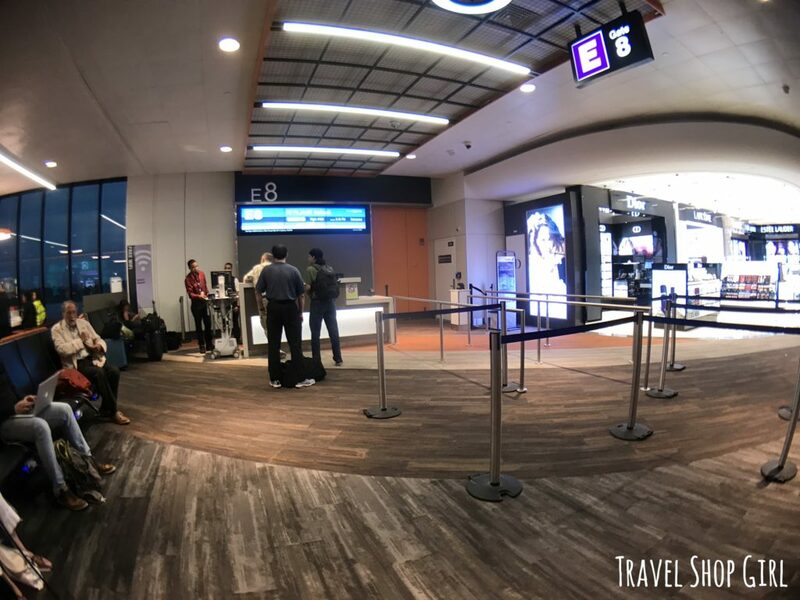 TSG Tip: Getting to the lounge is now different since renovations have changed Terminal E’s layout. Follow the signs taking you down the escalator and to the left to the lounge. If you haven’t flown out of Terminal E at Boston Logan International Airport, just wait until you see the changes. Not only is it substantially bigger, but there are more seats, more places to charge your phone, more stores and restaurants, but overall significantly nicer and more modern. This includes the departure gates, which have also changed. It almost makes delays tolerable. I’ve written before about how if you choose wisely, you, too can enjoy a better seat when you fly IcelandAir Economy Comfort, but let’s revisit that here. IcelandAir Economy Comfort uses the same configuration of three seats across, but with the middle seat left empty. 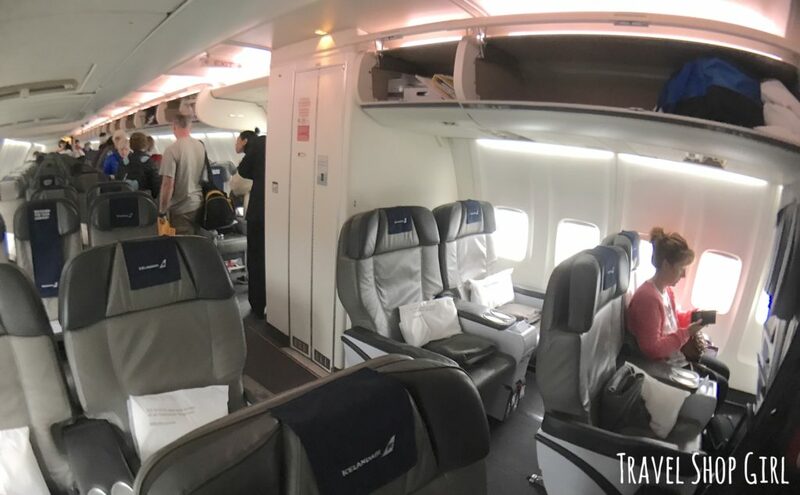 TSG Tip: You can see the rows of traditional Economy Comfort class seats just behind the larger Saga Class seats on the left side of the pic above. If you look at the seat map for your particular flight, you might think that all seats for IcelandAir Economy Comfort are in rows 7-9, but that’s not correct. In fact, rows 5 and 6 are also Economy Comfort. However these seats are larger with two seats across. It’s up to you where you want to sit and what kind of seat you prefer, but as for me, I’ll gladly take the larger seat any day of the week. You’ll get the Saga Class seat, but don’t expect Saga Class service as after all, you’re still in Economy Comfort. Call me crazy, but I happen to really love airline amenity kits. I reuse the bags for packing for other trips. On my recent flights with IcelandAir, both flight FI632 to Iceland and FI633 to Boston, there were no amenity kits whatsoever. Yes, the flight attendants came by with a tray and offered passengers headphones, earplugs, and sleeping masks, but the idea of an actual amenity kit is long gone for this class of service. 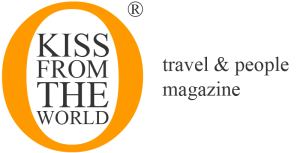 While Saga Class passengers receive special Business Class meals, IcelandAir Economy Comfort passengers can choose off the same menu as Economy class passengers. However, passengers aren’t charged for anything they choose, but for champagne. Choose from sandwiches, snacks like potato chips, chocolate, and beer and wine. 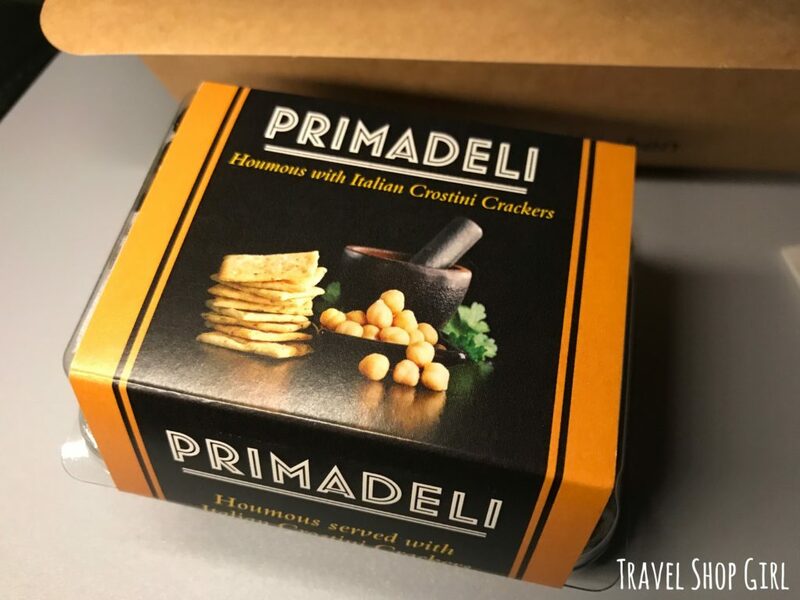 I chose the hummus and chips that came in a super tiny little package, but was great as a snack. But did you know that after you book your tickets, you can choose both your seats and food for your flight? I pre-ordered salad for both Mr. TSG and myself as well as his favorite, Skyr. 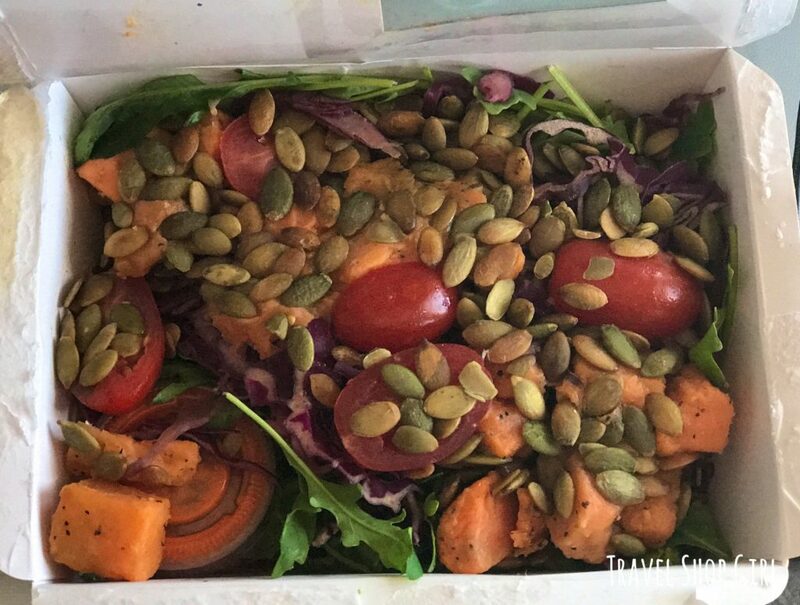 TSG Tip: While the salad is fantastic and I highly recommend it with cabbage, pepitas, tomatoes, sweet potatoes, and arugula, if you’re a vegan or vegetarian please note that what you might think is an extra topping for the salad that they serve separately is actually chicken. 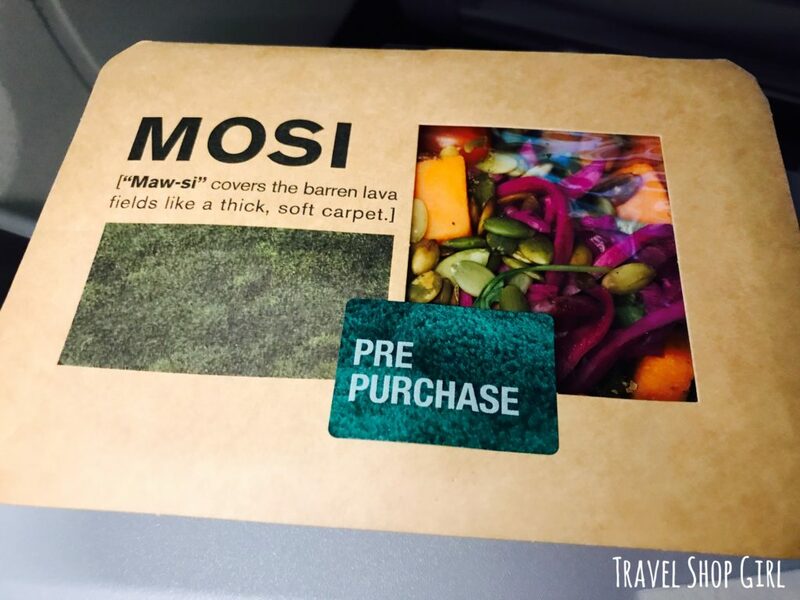 On the evening flight out to Iceland, the cabin was dark and the flight attendant served it and Mr. TSG didn’t look and just dumped it on his salad. 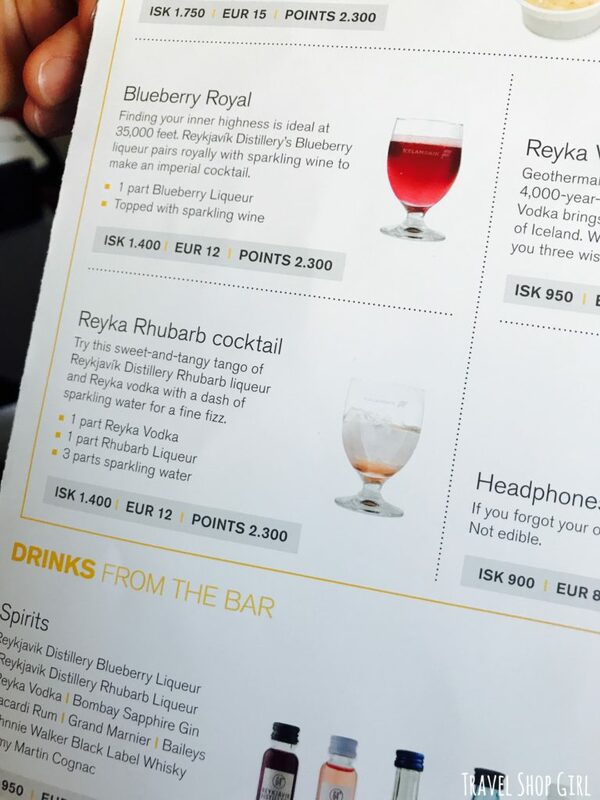 In addition to soda, beer, and wine, did you know that you can also enjoy spirits and cocktails onboard IcelandAir? They even list the ingredients in the cocktails so you can make them at home, which I certainly will after picking up some Reykjavik Distillery Rhubarb liqueur in duty free at Keflavik airport. I was more than a little disappointed when we landed in Iceland without breakfast or even coffee or tea before landing. No water, no juice, no breakfast of any kind. Had I known, I would’ve grabbed something extra when the flight attendant brought me my salad 90 minutes after we took off from Boston. There wasn’t any additional food or beverage service at any time during our flight and no menus in the seatback pocket. Our flight back to Boston was considerably better as the flight attendants did check on us several times during our flight. TSG Tip: Do what I always do and pack a few protein bars for situations like this. As airlines continue to cut back and charge more, think like a Boy Scout and always be prepared. 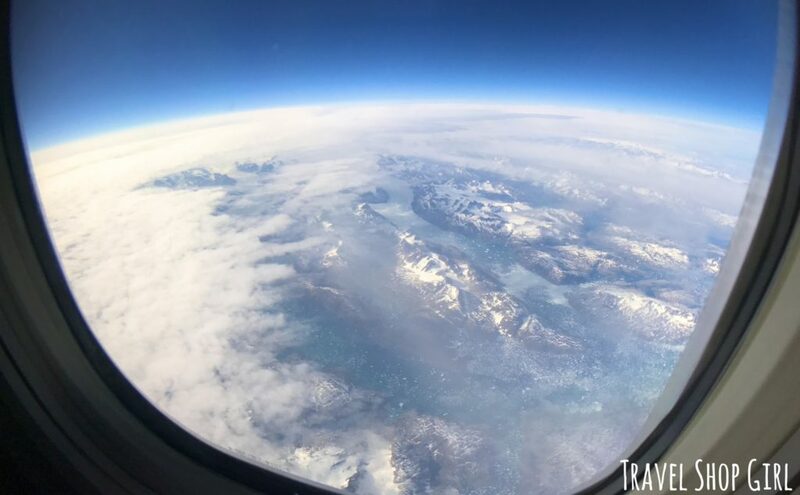 Regardless of food, drinks, or service, the view out of the window on a flight to Iceland is always incredibly spectacular. Just look at that view! I need to plan a trip to Greenland soon I think. Flying IcelandAir Economy Comfort to Iceland as your final destination or on a stopover to another European destination like Brussels. 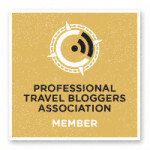 From there, maybe you can plan a trip to Bruges. Or maybe you’ll want to fly to Paris, Milan, or Munich. The stopovers combined with a quick flight from Boston or from any one of a number of cities that IcelandAir serves equals one excellent getaway. If you haven’t flown to Iceland yet, but are considering it, check out some of my other posts about Iceland with great Iceland travel tips and ideas. 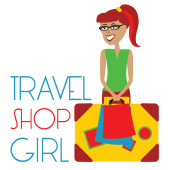 Check out the rest of the Travel Shop Girl website and if you have any comments or questions about this post, leave them below.